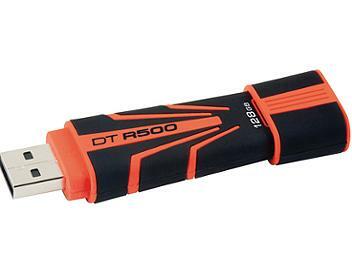 The 128GB Data Traveler R500 USB 2.0 Flash Drive from Kingston is a compact and portable way to store and share data. The drive's outer case has a striking orange and black rubberized finish for durability, scratch-resistance, and excellent grip. The solid-state memory, combined with the rugged design, offers excellent shock resistance to keep your data safe. The drive is fully compatible with high-speed USB 2.0 for blazing data transfer rates that make it easy to share videos, photos, and more. The drive is bus powered for plug-and-play use on Windows, Mac, and Linux systems with no drivers, batteries, or external power required.